Life is but a dream…. Sometimes we talk about getting another big dog. A big dog could accompany Dearly Beloved on his daily five-mile walks and perhaps get me off the sofa and out for some brisk exercise. A big dog would offer a measure of security and discourage door-to-door solicitors, unlike Miss Piggy, who’d sell us out in a second for a corner of burned toast. We find ourselves looking at dogs when we’re out, wondering, “This size?” Last month during a walk on the beach, I met a dog which helped narrow the parameters in my own mind. N o t t h i s b i g.
that’s a mini-horse, not a dawg. I wish I were in Florida about now. Wonder if he was named after Van? I adore Danes, hope you go there but expect your food bill to leap and your couch to no longer be a place for you to sit. They really aren’t agressive but they intimidate the most fearless just with their size. Also, one with a dry mouth is a must. Did you know Dane’s make great apartment dogs? They are big but “most” are not overly active–except for that lethal tale. The one I keep likes me to turn on the kitchen faucet for him for a fresh drink of water. I love them and in fact grew up with them before Dobermans…but they live such short heart breaking lives. A perfect dog and I really mean this might be a Doberman. Since you owned an Akita– an exceptional Akita…you would adore a Doberman. I just know it and yes with good breeding they are excellent grandchildren dogs. If you are ever serious about another dog-you have my e-mail and I have friends…. My workplace friend had Great Danes, but Katybeth is right—hers only lived to be around 9 years old, tops. So what did my friend get after hers passed on? Toy Fox Terriers—the opposite end of the doggy spectrum. How about a Chihuahua? DB could carry it on his walks and their poops are about the size of a Tootsie Roll. 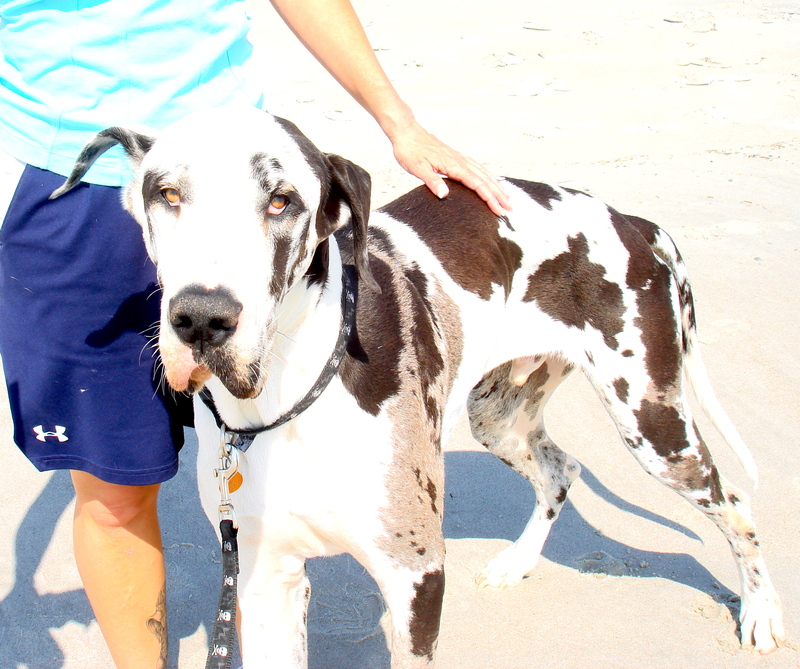 My BIL had a Dane for sometime. She recently passed away. She was the biggest baby I’ve ever met and was always good for a walk or a run. We had friends who had two of them. When their daughter started walking she quickly learned to put her hands on her head when she heard them coming because she was almost certainly going to get knocked down as they raced by. I suppose it worked out all right though. The little girl became a talented gymnast, having learned early on how to keep her balance. I am so partial to big dogs! If we didn’t have three kitty cats, who would strongly object, and my husband’s stupid allergy, I would have lots and lots of big dogs. They are gorgeous animals but… they’d completely take over everything! I love big dogs, but you’re right that is REALLY big. Mine was a lab/husky mix, such a sweet dog and a great companion. He never really got me off the sofa, but he was always happy to lie on the carpet next to it! I love my big Lab. He is dedicated to all fault, and wears his heart on his sleeve…er leg.